Following on from the Waldeck post below, here he is again under the Saint Privat moniker. 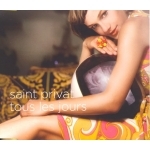 Saint Privat is Waldeck and fellow Austrian singer Valérie Sajdik. Pour yourself a Gin and Tonic and soak up Tous les jours, the connoisseurs’ summer hit of 2004 in Germany, Austria and beyond. They have since released the album Superflu, heralding the revival of the “Chanson psychédélique”. Chill out baby.